It seems the APU2 won't boot from USB3 drive and external USB2 card reader. Booting from a USB2 thumb drive was not a problem. Or try to update the BIOS / firmware. This is a netinstall, you'll need an internet connection. Enable Legacy console redirection in BIOS. Boot APU2 from USB (press F10 for boot menu). Press <ENTER> to start install. 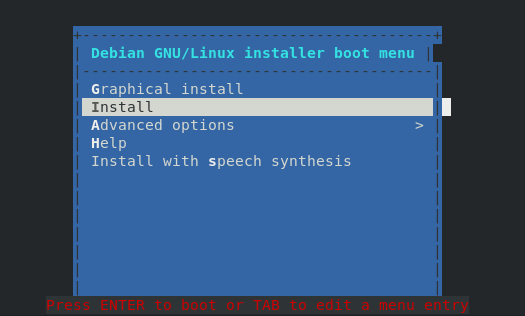 During install, deselect any desktop environment and select the SSH server and standard system utilities. text is deprecated. Use set gfxpayload=vga=off before linux command instead. Reboot, and at the grub menu press e and remove the vga=off option. Press ctrl-x to boot. Configure SSH. Use SSH to complete the configuration. System should be updated during install, but you can check / install if there are any updates. Known watchdog problem, it doesn't work with i2c and ccp loaded. To fix for now, blacklist the following modules. Alternatively you can blacklist sp5100_tco if you don't need it.